It’s October, Hallowe’en is coming and as two of my writing idols once wrote: Something Wicked this Way Comes. William Shakespeare gave the line to Macbeth’s witches. Ray Bradbury wrote a novel about an ill wind that blew in devilish characters. But in today’s parlance, wicked has come to also mean GREAT! When the universe sends you signals, the wise writer pays attention. I had something totally wicked happen to me and it has fired up my pen once more. I’m about to dive back into an old manuscript and I feel great! There’s lots of ways a writer can lose the muse with a story. Usually, it’s just a short-lived, middle-of-the-book depression that a chat with a supportive colleague can fix. Sometimes, it’s a bit tougher to get past and a workshop or two can help shed light on the lack of inspiration. Occasionally, it’s much more serious and can lead to an abandoned manuscript. Not all manuscripts can or should be resurrected. I have a couple in the drawer that I consider to be “training wheels.” But I also had a novel in progress that was a contemporary retelling of an old Breton fairy tale. It was a risky business, taking the magic of the tale and reworking it. But I disliked the so-called happy ending and I knew the main character deserved a much better happy ending. It was great fun and a huge challenge. I had to make the magic real and the reality, magical…yet grounded. I re-read Arthur Ransome’s Old Peter’s Russian Tales, Grimm’s deviously delightful fairy tales and William Goldman’s The Princess Bride. I dived back into my cultural studies oral narrative course work, spending time with The Mabinogion and Alice Kane’s The Dreamer Awakes. I let the rhythms fill my bones and added layers of story to the novel. I was on a creative roll. I signed up for a week-long writing retreat and symposium. I felt that being far from home with experienced authors, attending workshops and most importantly, one-on-one sessions with a well-published writer, would offer me insights and inspiration. The escape to a distant location was amazing. Expansive horizons in a rural setting. My own private room and writing space. Far-off coyotes howling and yipping every night. We even had a gorgeous full moon. And somebody else cooked for me. Heaven. Surrounded by writers at all levels of the writing journey, I enjoyed listening to the enthusiastic and generous teaching faculty. Except for one thing: my mentor writer was less-than-positive about my story. I arrived at our one-on-one session and when handed back my submission, I saw my retreat mentor had read the 10- or 15-page excerpt. There were plenty of notes scribbled in tiny script on those pages. But I was tough. I figured I could take it. I left that one-on-one session a total mess. I was asked if I were writing a story for children. Oh my God, I thought, I’ve been writing a children’s story all along? I was told to read other fairy tale re-workings and learn from those authors. I should have said “I have,” and then named them. I should have asked what the mentor knew about writing for children because I sure knew the difference. I should have asked why my mentor’s tone was so condescending. I should have asked a lot more questions. Instead, I simply took it all in. My mentor had published books in book stores. My mentor had an agent. My mentor seemed to be “in” with all the other faculty. I arrived at that retreat excited and enthused. And while I benefitted from the other opportunities the retreat offered, I left feeling confused and that I’d made a mistake. I didn’t challenge my mentor. I didn’t ask questions. I let the whole thing simmer instead of addressing it on the spot. And I may have missed an opportunity to take in valuable insights from my mentor because I was so distressed. My mentor did not abandon my story. I did. It’s been eight years but the universe has conspired to bring me back to Yvon’s tale. This past summer, I needed something to read for a maximum of 7 minutes at a public event. Something “light or humorous and crowd pleasing” the invitation suggested. Trying to find a short passage was a challenge, and a lot of my work is serious, sometimes edgy stuff. And then I remembered the opening of Yvon’s story. Ironic and satirical and just a little bit magical. So I dusted it off, tweaked it here and there, and read 7 minutes to an appreciative crowd this past summer. But the clincher of the universe nudging the muse along was a post a colleague writer put on my Facebook page two weeks ago. She was part of a novel-writing group we were in together when I first developed Yvon and his story. She posted a cartoon of Baba Yaga — a witch character who shows up in my manuscript. Bingo! How could I turn my back on Yvon a second time? Two weeks ago, I met with another mentor, author Frances Itani. She is the 2018 Writer in Residence for the Arts Council of Haliburton Highlands where my cottage is located. Frances read a brief excerpt of Yvon’s story and offered excellent advice: practical, encouraging and insightful. She pointed out strengths in the style and areas to tighten. And most importantly, she asked me questions related to the theme and heart of the story. Questions that helped me plan the revision to come. I’m just finishing the edits on my YA sci/fi novel, getting it ready to go out to agents once more. This time, it won’t be a challenge to let go of The Last Battlewipe because The Perfect Beauty of Yvon Torville is waiting for me to get started again. I’m a lucky writer to have such a busy muse these days. It’s totally wicked what this way comes. Writer: Who’s in Your Tribe? Margaret Laurence, one of Canada’s exceptional writers, spoke of the other Canadian writers — friends, colleagues or just-starting-out — as “the tribe.” It was at a time when writing was a lonely business in Canada. When literary prizes were few (let alone boasting glitzy galas and live broadcasting) and especially for women writers, when there were few achieving success and critical acclaim. So for Laurence, she saw the truth behind the word “tribe”: a community of humans. In ancient Rome, the root word of tribe, tribus, meant a division within the state. When European settlers began explorations, they used the word “tribe” to describe any and all cultures they came in contact with. I guess it was a handy, one-size-fits-all way to deal with difference and we’re still dealing with the fallout of that conquer-all mindset. But back to Margaret Laurence and her use of tribe. It was a term used in a good way, meant to gather together the group of humans who penned words, often without any hope of recognition or acclaim. Her tribe was other Canadians driven by the passion and need to write. Some years ago, I had a chat with Linwood Barclay, then a Toronto Star columnist and now a hugely popular author of mystery novels. He told me how Laurence was a mentor to him when he was a student at Trent University. He never forgot her kindness and direct, unerring eye, and the difference it made to his eventual career and international success. Linwood was in Margaret’s tribe long before he was selling his books in the millions. And Laurence was in his tribe, long before he realized he had a tribe. My tribe is difficult to capture in words, mostly because it is a loose-knit connection of all kinds of writers. Sometimes I spend more time with some tribe members than others. My intense critique group, Critical ms, where we give written and verbal feedback to each other, meets every other week, alternating between Peterborough and Whitby. The Writers’ Community of Durham Region counts among its membership many writers who I am so happy to call friends as well as colleagues. My tribe also includes the Canadian Authors’ Association, CANSCAIP, The Writers’ Union of Canada, the Muskoka Authors’ Association and the Muskoka Novel Marathon group (the photo at the top of this post is from 2014, the year I attended the MNM in Huntsville.) I’ve recently expanded my tribe to include members of the Literary Arts Roundtable of the Arts Council, Haliburton Highlands. Do I know everyone in all those organizations? No. Do I support the work they do and volunteer when I can to help them grow and support other writers? Yes. Do I have members of my writing tribe who don’t belong to any of these groups? Yes indeed. And do I have members of my writing tribe who I value beyond the ordinary? You bet. I have a core group of writers who I might term My Tribe within My Tribe. My go-to people when the rejections arrive and the first ones to know when I’m celebrating. The ones I will drop almost anything for if they need my help. Some have been in my tribe since 1996 when I started this crazy journey of words. And some are more recent core members. They are more than friends and colleagues, and they know it. My tribe also includes people who are not writers. The people who support and encourage my writing — family and friends who turn out for book launches, readings and events I help organize. And I learn from the non-writing members of my tribe. I learn about books I might not have picked up myself to read. I ask research questions and get directed to places and people who can help. I have beta readers who offer feedback and suggestions. In short, a writers’ tribe benefits you when it’s not an exclusive group. So who’s in your writers’ tribe? Is it like my ever-expanding circle of contacts or a more intimate group or a combination? Is your tribe online or face-to-face? Is it just Canadians or does it have an international flavour? One thing is certain: Writing is a solitary act but it doesn’t have to be a lonely one. My grandmother wore hearing aids. Bulky beige plastic half-moon shapes sat behind her ears. They were attached to wires that held a small custom-moulded earpiece to fit into each ear canal. The aids helped with her hearing but at times the high-pitched whining feedback loop was terrible, and she constantly had to adjust the volume. As a child, I thought it seemed a lot of work just to hear better. As I got older, I wondered what it would be like to have to wear hearing aids. As fate (and genetics) would have it, I’m about to find out. Why would a writer need to worry about perfect hearing? After all, my work exists between my fingers and the keyboard and/or the page. I don’t need to hear what I’ve written when I’m editing—I just need to know that I’ve used the best possible words in the best possible order. I write fiction. I am especially drawn to characters—their motivations, fears, desires, idiosyncrasies. And I’m curious about them and love to get inside their heads—in short, how their actions and reactions reveal who they are. Dialogue is a huge part of revealing character. Through conversations and interior monologue, I get to do a lot of exploring and developing interesting characters. And getting that on the page is what gives readers insights into what makes characters tick. What they say. What they don’t say. And how they say it. I like to think that I’m pretty good at this part of the writing process. I have, as they say, an “ear” for dialogue, for the way people speak and I’ve learned how to use that in my fiction. I’ve honed that skill by reading how other writers use dialogue. And I’ve further honed that skill by listening in on conversations over the years, by paying attention to how people speak, and especially if they have an agenda or perhaps something they want to keep private. But lately, I’ve had some trouble with that listening-in part. Over the past year or so, I’ve gone from occasionally asking people to repeat themselves to missing about 40% of what is being said around me. Phone conversations are more difficult. The television is set at an increasingly high volume. Indeed, our PVR has been a godsend so I can rewind and replay two, three even four times to get what I missed. But does this actually affect my writing? I suspect it does in ways I’ve not yet considered. And most importantly, it’s severely limited my listening-in skills. My gift for dialogue doesn’t rest at my fingertips the same. It’s almost as if I have trouble hearing what my characters are saying. A hearing loss is isolating and while I can still turn to writing to focus my energy, I am missing out on aspects of life. What I write and how well I write is directly affected by me living a life outside my writer’s room. I’m inspired by the world around me. From birdsong in the early morning to the river’s gurgling at the cottage to the chatter of people in the grocery story, it all is part of what makes me the writer I am. Sure, the act of writing is solitary. But for me, it is the result of all the senses in play in the world around me. There is nothing solitary about that. I’m lucky. I have the means to purchase hearing aids that should help me return to the conversation of the world. And if I’m right, those hearing aids will give this writer a much needed boost of inspiration and life. In 2015, The Guardian newspaper published an article Hearing Words, Writing Sounds: Examining the Author’s Brain. It’s a fascinating glimpse by Richard Lea into the idea of two kinds of “listening” — writing and reading. For Pakistani and UK novelist Kamila Shamsie, “It’s about the sound of sentences.” and accordingly, she reads her chapters aloud when she finishes each one. But Booker Prize winner, A.S. Byatt, never reads her work aloud because there are “clearly distinct forms of written and spoken language”. …patients with specific difficulties in speech and writing for 15 years [demonstrating] that writing and speaking are supported by different parts of the brain, not just in terms of the processes controlling the hand and mouth, but at deeper levels of the language system that contain knowledge of how words are put together. Like Shamsie, I often read my work aloud. Does that mean I’m listening for something more than what I see on the page? I think so, even if I’m not too sure what it is that I’m hearing when I read my work. How about you? Read The Guardian article and think if “listening” comes into your process of writing. Or, like A.S. Byatt, do you keep your focus strictly “on the page” in how the words work? Okay, I know; I know. New Year is yelling out “GOALS” and “RESOLUTIONS”, and no one really wants to hear it, least of all me. But when I got to thinking about it, I realized I have a few ongoing goal-setting and goal-achieving tools in place already. And they work! So I thought I’d share them with you. While I’m a great supporter of having big long-term goals and a vision of where you want to go in life, I find that sometimes the big picture can be overwhelming. I believe that those big concepts should be the background canvas on which you paint in the details as you go—and re-paint them if you choose. The writing critique group I belong to understands this perfectly. We meet every two weeks and at the end of each meeting we all set a writing goal for the next two weeks only. We each set our own goal depending on what we are working on at the time and what is happening in our lives. This system works because it is frequent, achievable, and there is accountability. Small goals and small successes that add up over time. Mark Twain once said that if you start the day by eating a frog you will have the satisfaction of knowing that this was probably the worst thing you had to do that day. The frog is a metaphor for your biggest and most important task of the day and has become a popular procrastination-busting technique. When I’m trying to avoid that “frog”, I play solitaire, disappear into social media or sort the kitchen junk drawer or….. I’m sure you have equally pointless—and time consuming—avoidance tactics. Learning the skill of attacking the most important task first (writing related or not) and getting it out of the way frees you up. You’ll have more time, less guilt and a clear mind to be creative. It’s a skill that helps you accomplish whatever you set as your priorities—including your goals. It does take practice, but like anything in life, the more you consciously do it, the easier it becomes. Most writers can perform to a deadline. Perhaps putting your own deadline on your “frogs” will help? Now this may seem contradictory to the “eat the frog” principle, but getting through your to-do list and achieving your goals begins with making your bed. All I know, it works for me. Today, go make your bed, then sit down and decide on a reasonable achievable goal to be accomplished within the next two weeks. Then break it down into what needs to be done first, and then next, and next after that…. Tomorrow, make your bed, look to see what is #1 on that list and eat that frog. A writing retreat is a great way to focus on your writing projects and goals and registration for Writescape’s Spring Thaw 2018 is now open, and already half full. It’s winter. Ah yes. There’s no escaping it, but guest blogger Felicity Sidnell Reid sees it as a chance to indulge in books. And she tells us how a particular book turned a cold day into a warm experience. When the wind is whipping snow around my garden and even my dog is reluctant to brave the cold outside, it’s time to read without guilt. My Christmas, this year, has been filled with books. And the weather is cooperating, encouraging me to stay home and read… and read. 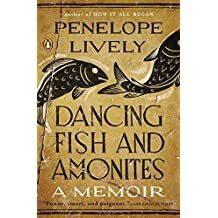 At present I am perusing Penelope Lively’s memoir, Dancing Fish and Ammonites. Penelope Lively is the author of 17 novels, 3 collections of short stories and several memoirs. She won the Booker Prize for Moon Tiger (1987) and has been awarded many other honours. Dancing Fish and Ammonites is full of insights for writers, as well as, a passionate defence of reading and books.Its discursive nature demands such attention. Written when she was 80, she reflects, in a series of essays, on Old Age, her Life and Times, Memory, Reading and Writing, and Six “Things”. Her book is not a chronological narrative, but more of a conversation, which bewitches the reader into silent — or sometimes out-loud debate. I found myself commenting, questioning, agreeing and disagreeing as though she were sitting across from me by a flickering fire, surrounded by her personal library of books—which seemed a little odd because Penelope Lively is not a cosy author. Sympathetic to the human condition, in her fiction she creates complicated, engaging characters with a masterful brush and brings her narratives to a satisfying conclusion. But a certain detachment and a satiric eye also contribute to the style of her writing. Not surprising then that her memoir turns out to be an examination of the ideas that have shaped her life, rather than a chronicle of it— but, though I’ve finished the book, I still don’t know how she made this discussion so intimate. Lively has always been deeply interested in time, memory and context. “A lifetime is embedded; it does not float free; it is tethered to certain decades, to places, to people…” Though she read history at University, she has had a life-long interest in archeology. Artefacts and the physical evidence of the past which she examined in The Presence of the Past; An Introduction to Landscape History (Harper Collins, 1979) as well as personal and contextual history, have inspired much of her writing. She explains that, “age, memory, time and this curious physical evidence of what I’ve been up to—how reading has fed into writing” are the topics of this meditation on her life. And personal memory is a “mass of lurking material” which frequently inspires or colours one’s fiction. “Time itself maybe inexorable, indifferent, but we can personalize our own little segment; this is where I was, this is what I did.” So is it memory which makes us who we are? Then Lively considers the importance of reading and how that has shaped her life. Living, always, in a house full of books, she knows that the “inferno of language” sitting on her shelves, is sorted by the mind; much is discarded, forgotten, but a “significant amount, becomes, that essential part of us—what we know and understand and think about above and beyond our own immediate concerns. It has become the life of the mind. What we have read makes us what we are…” A survey of a lifetime’s eclectic reading illustrates how it refines a writer’s taste and allows the exploration of a myriad of possibilities. She recalls the wonder of wandering in libraries, of how the “reading of a lifetime—has been [a] marriage of the fortuitous and the deliberate, with the random, the maverick choices tipping the scale and serving up, invariably, the prompts for what would next be written.” This is not to say that writing is a direct response to what we read for it may be years before it becomes the prompt for a story or a novel. In her final chapter, Lively returns to the topic of identity. In picking out six objects she values and which “articulate something of who I am” she gives the reader another look at herself, the interests of a lifetime and how her imagination works. Felicity Sidnell Reid is an author, poet, artist and broadcaster. Her historical novel Alone: A Winter in the Woods was published in 2015. She is a co-host on the radio program “Word on the Hills” on Northumberland 89.7FM .